When we talk about the interior or exterior designing of home there is nothing better than decorating your doors. Doors of our homes create the first impression to in front of guest so; it should be unique and attractive. There are many door hacks you can use to make your door distinctive and eye-catching such as you can use different door handles, door knobs and unique door pattern. When we talk about interior or exterior designing, you should choose or undergo to a particular theme. Theme based interior and exterior designing will give an alluring and eye-catching look to your doors and home as well. In this article, I give some hacks to decorate your home doors in terms of door handles, door knobs, and door pattern decoration. Yes, it is true that small objects can create a big impact on your door decoration and make your home doors attractive. 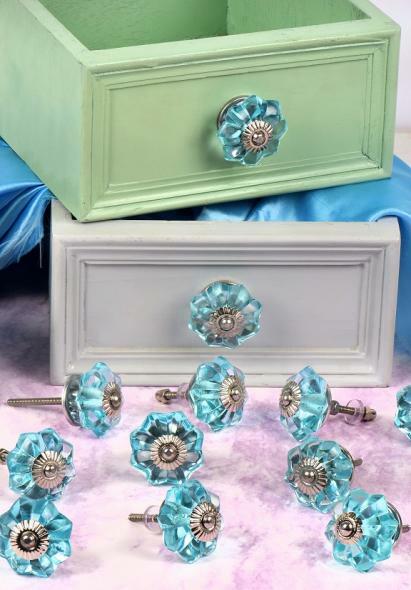 Small doors knobs can are little pretty things but they drag the attention of guests with their attractiveness. Ceramic door knobs can be used to any type of door such as on a metal door, glass door and wooden door. A ceramic wooden knob is handmade and comes with floral printing design which is attached with a brass back support plate. This square glass door knob gives a rich look at the doors of your home and looks ravishing on wooden and metal doors. It has a complicated design with a simple round knob on the top and square metal plate on the back which makes it royal and stylish. Glass doors handles and knobs are a combination of vintage and modern look. A Glass knob is extremely eye-catching and gives a very impressive look to the door of your home. glass knobs usually come with a brass plate on the back and this gives an elegance to the doors. If we talk about wooden knobs then texture plays an important role in it. Wooden knobs give a very natural and royal look to the doors and it is very easy to maintain the shine of wooden knobs. You just need to apply some oil to remove the stains or you can also use polish to give a shiny and glossy look. Octagon pointed doorknob is a latest and most stylish knob with an outstanding detailing and fixture. If you use this octagon pointed door knob then it will give a stylish look to the door and it is made of different metal like steel, brass, and bronze you can purchase as per your door look. This dome-shaped doorknob is a perfect impressive small object which can add a huge impact on your door. This door knob is very simple and sober and made of bronze, brass and comes with a plate finish on the back plate. A Brass swirl door knob gives a vintage look to the door and it is very much suitable on metal doors with golden lining on the edges. This knob is made up of brass in a swirl design with gives elegance to the knob and door as well. A very simple, sober, impressive and effective porcelain white colored door knob is here. A perfect finishing on the edges with a beautiful look on the door this is the specialty of this porcelain doorknob and a perfect choice for your wooden door. Octagon is the most likely shape when we talk about the door knobs. An Octagon iron center knob gives a traditional touch to your home and they are well suited when you used them on black and golden color door. A stunning and beautifully designed bun shaped doorknob is a perfect choice for your home if you want to give a royal look to your home. It has a flower-shaped metallic plate on the back that supports the knob and gives a rich look. As I have mentioned in the above context that doorknobs are small but creates a huge impact on the designing of doors. Similarly, door handles also create a huge impact on the door. You have to very conscious while selecting a perfect door handle for your home doors. When someone enters our home or in our room then the first thing that person see is the door handle door which means you have to make a perfect contrast and choice of door handles with doors. So, let’s have a look at some of the designer, traditional and authentic door handles. Doctor door handles give a classy and vintage look to the front door and looks ravishing on your metal as well as the wooden door. This door handle is simple but has an elegance which drags the attention of everyone. And basically, it is made of brass and a fine plate on the backside. This lion head door handle is perfect for those who want to give a royal look to their doors and home as well. This door handle gives a royal and vintage look and it was mostly used at the time of kings. Glass door handles are the sober, simple and full of elegance because they have a rich and shiny look. Glass door handles are usually made up of stainless steel which is easy to clean and maintain. Glass door handles are perfect choice your glass doors and it comes in many designs. A Lever latch door handle is very basic door handle for your home. It is made up of stainless steel and a perfect for dining room, living room or bathroom. It looks sober and gives elegance to the door. A ceramic bridge door handle looks very ravishing on the door and perfect for those who want to give a royal look to their home. It is the perfect choice for your main door because it shows the royalty of your choices in terms of door handles as well. As I told you about Glass door handle which is made of stainless steel but glass bridge door handles are completely different from those glass door handles. A Glass bridge door handle has two glass knobs on each side and a bridge of glass is in between the knobs. This handle is very latest and many people are using it because it looks latest and gives a royal look. A vintage metal door handle is usually made up of brass or bronze and comes in many shapes. The shape can be of a lizard or a snake or a fish. This vintage door handles actually give a vintage look to your home and perfect for wooden doors. A small designer with a circular plate on the back and it is a lever on the rose door handle. This door handle is an ideal choice for bedrooms door. It has a straight handle which is very and a circular plate and made up of stainless steel. Standing woman metal door handles are usually used on the door of the temple to give an authentic and traditional look to the doors. It is made of brass or bronze and they are very easy to clean and maintain. Key shaped brass door handles very used at the time of kings but now they are also a new choice for many people. To give a traditional look to their home many people are using these key shaped brass door handles. To give an impressive or eye-catching look to your home door or the main door you should use a unique door pattern with some matching door knobs and door handles. A door design depicts our house interior designing to the guest from the outside. So, you should use some authentic or traditional design because these designs can easily drag the attention of your guest and give your home a ravishing look. Read Also - 8 Easy door hacks that you can implement at Your Home!